I am back with another one of my favorite series. Today I'm going to be sharing my favorite foundations; why they are my favorite, what kind of coverage each of them give and what tool I found works best when applying each foundation. I have gone through tons of foundations some that worked out very well for me and others that ended in disaster. I am going to begin sharing the foundations from my least favorite to my all time favorite. Keep in mind that when I say least favorite it doesn't mean I don't like the foundation I mean it is included in my top five favorite foundations, but one had to come in last place and I just like the other foundations maybe a hair more. Also I wanted to mention a quick FYI on my skin type. I know I have mentioned this many times in the past my skin type is oily so most of these foundations works best for my skin type. I feel my skin is pretty normal on the outer area of my face but I get pretty shiney on my T-zone some days more than others depending on how hot the weather is. The first foundation I'm going to talk about is a drugstore foundation and it's the only affordable one that made it to my top five favorites. I was first introduced to Rimmel London stay matte foundation by my sister in law. I was in the market to purchase a more affordable foundation so that I could use for work and not use or waste my higher end ones. Mary had told me how she really liked this one and that it is a matte foundation which is exactly what I need for work. I decided to give it a try even though in the past almost every single drug store foundation I used never worked out for me. Drug store foundations will either not last on my face for long, makes me look very greasy and quick, or it ends up breaking me out. I remember loving how this foundation looked on my skin after the first time I used it. My skin looked very smooth the finish was beautiful and full coverage. I was extremely happy once a couple of weeks passed and my skin hadn't broken out. This foundation has a liquid mousse texture and claims to have a natural finish along with being light weight. I completely agree with those claims. This foundation kept my skin looking smooth, flawless and matte all day! I think any skin type can use this because it isn't drying at all. A lot of drug store foundations wouldn't make it to the eight hour mark and this one definitely does. I also love to apply this foundation with a beauty blender I found it gives the most natural finish while still giving me great coverage. If you are looking for a matte affordable foundation, I 100% recommend this one right here. It has never disappointed me and that says a lot. Now we have the Nars all day luminous weightless foundation. When this foundation first came out I was very excited to try it out since I had heard it was targeted for people with oily skin. I was also hearing lots of great things about it. This foundation gives off a natural glow without looking greasy or oily. I feel like it still keeps me pretty matte but glowy at the same time. I am able to get either a lighter or full coverage finish. When I first started using this I was in love and it quickly became my number one favorite foundation. Weeks later I began to notice that some days by the end of the day my makeup started to break up. This didn't happen all the time so I couldn't figure out what was going on or what was causing this to happen. I would switch off with using a brush and a beauty blender to apply it and some days the foundation looked beautiful by night time. Then other times once again it was separating and it was making me skin look cakey. I kind of pushed it to the back of my foundation drawer and forgot about it. It wasn't until the middle of summer that I started to use it again. I had remembered one of my friends that works at Sephora had told me when this foundation first came out that it was meant to be blended out with your fingers but since I never do that I ignored it. One day I decided to give that a try and boy did it apply beautifully. I first apply the foundation using my fingers and blend it in. Then I go over with my beauty blender to make sure everything is completely blended in and it looks great. My makeup looked just as great by the end of the day as it did when I first applied it. There was no separation or cakeyness and it still allows me to get a good amount of coverage. I am very happy that I tried applying it with my fingers because if I didn't it would have gone to complete waste. I would probably not have used it again and the bottle is still pretty full. This next foundation I like to wear on days where I am looking for a more of a lighter coverage, usually during the spring time although I mainly use it for photos. 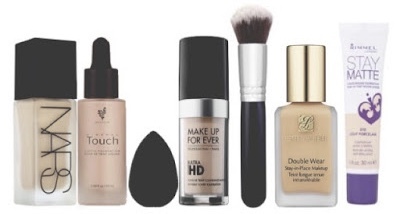 If I am doing my makeup to post on IG 99% of the times I am using the Make Up For Ever HD foundation, old formula. I purchased this foundation a couple months before they released the new formula so I have no idea how that one works, looks, or wears. This one on the other hand I love for photos since it was developed to make you look flawless in photography and television. I feel it does exactly that and my skin always comes out looking for good. It has a very flawless and natural finish even with the lightest layer. I don't like to use this foundation on warmer days or all day either because it doesn't keep me matte and I end up getting oily on my T-zone. This foundation isn't meant to mattify you which is why I like to stick to using it for photos or for a light coverage like I mentioned. I like to apply this foundation using either a flat top brush or beauty blender. You guys know how I love my beauty blender I don't think anything compares to it but I have found that even with using a brush with this foundation it still looks great. I definitely see a difference in my up close makeup photos when I'm using something else. All right so for the last two foundation this was extremely hard to choose which was my number tow and one favorite foundation. I was going to make them a tie but I have to be honest I do like one a very tiny bit half of a hair more even if it pains me to admit. My second favorite foundation is the Younique mineral touch liquid foundation. A few months ago I even did an entire review on it so I don't want to spend too much time talking about it. I still absolutely love this foundation. Since I posted the review on this foundation it has literally been the only foundation I was using up until the end of August. I realized I needed to start using up some of my other foundation more haha. I love it for many good reasons, it makes my skin look flawless, natural, and gives off a natural glow while keeping my matte. It keeps me matte all day and looks beautiful whether you decide to go with a light or full coverage. It also lasts all day on me. I love to apply this foundation first using a makeup brush. I blend it all in then I grab my damp beauty blender and go over everything with it. This helps me ensures that everything is blended and picks up any excess product that the brush may have left on my face. It leaves a beautiful finish to my skin. This foundation reminds me a lot of the Nars one I spoke about above except this one keeps me more matte. The reason why I choice to make one my second favorite is sometimes on days that was ridiculously hot out and I applied a fuller coverage by the end of the day my face would be a tiny bit oily. This isn't anything crazy and it can easily be fix with some blotting powder of course. Some days though I found even going in with a powder to touch up it would make the side of my nose look a tiny bit cakey, and this happens sometimes with certain foundations on hot days. Especially with a full face of makeup. My number one all time favorite foundation is the Estēe Lauder double wear foundation. I know this foundation is like a cult favorite for some many woman. This foundation stays in place all day without budging and it keeps me matte. Two key things I look for and need in a foundation. This foundation build ups beautifully and looks great as full coverage. If I have a blemish, it covers it up completely. I have yet to experience any cakeyness with it. I like to apply this foundation using a beauty blender because it is more thicker and the beauty blender will sheer it out. It helps my foundation to not became heavy and cakey. This is the foundation I always travel with because I know I will always get a perfect application. I always use this foundation while I am at Disneyland therefore I am able to use it all day and in hot weather. Since it is a full coverage foundation I don't feel its heavy on the face like some foundations can feel and it doesn't make my face feel gross by the end of the day either. I know this foundation is meant to keep people completely matte all day but by the end of the day, mainly while I am at Disneyland, I do notice a small amount of shine coming through on the bridge of my nose and tops of my cheeks. This doesn't bother me at all because it looks like a natural glow and it isn't overly shiny to where I look oily. I actually really love how this happens at the end of the day and think it looks very pretty. The shine I get with this foundation is a lot less than the with the Younique one. When I use the double wear foundation I really don't need to touch up my face ever, I do sometimes but I can definitely skip it if I wanted to. This is definitely a holy grail foundation of mine (Younique being one too) and I'm pretty sure it is a foundation I can't live without. I can even say this will most likely be the foundation I will use on my wedding day. What are some of your can't live without foundations? Let me know on the comments below maybe even some recommendations. I think I am going to have to get that Make Up For Ever HD Foundation and try it myself. One of my favorite drug store foundation/bb cream for those days that I don't feel like wearing much make up is the Maybelline dream fresh bb cream. It's really light and perfect for hot days. I've tried one BB cream like three years ago and I didn't like it cause it didn't give any coverage at all. Not even a light coverage and it made my skin super oily, I heard a lot of them do that? I do love the It Cosmetics CC cream though! That one has amazing coverage. I should have included that one on this post. Yaaaassss! I've seriously been looking for a new foundation! Yay so happy this helped. Did you end up purchasing one of these?